Cypress, CA – October 10, 2018 – Summoning those in search of exhilarating experiences, Yamaha Motor Corporation, U.S.A., launched a new YZF-R3 Supersport motorcycle today capped by the release of their video, “R World is Calling.” Serving as the entry point to the company’s 2019 U.S. Supersport lineup that includes the YZF-R6, YZF-R1, and YZF-R1M, the new YZF-R3 and YZF-R3 ABS models boast next-generation R-series styling and updated handling features. Yamaha has a rich heritage of building the most sought after Supersport motorcycles designed to deliver the pinnacle of performance on and off the track. 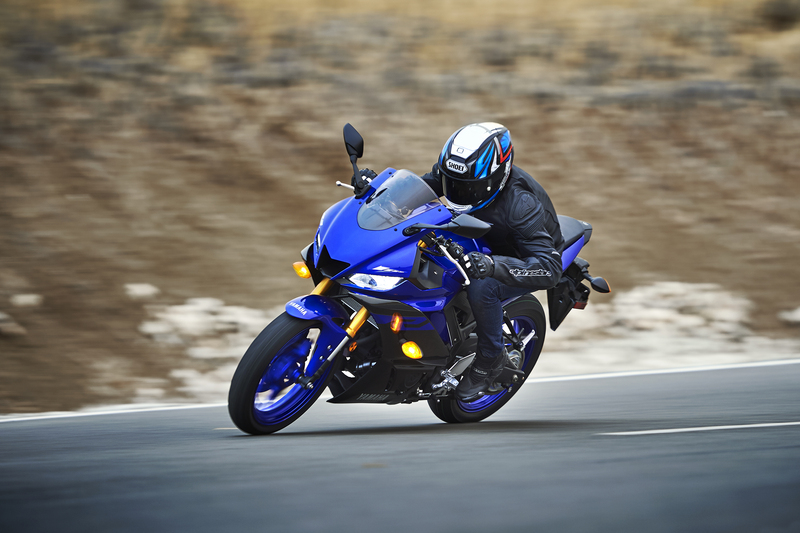 From the rider-friendly YZF-R3 to the competition-focused YZF-R1M, the Yamaha R-series model lineup provides options for riders of all skill levels to experience the pure exhilaration of R World. Powered by a 321cc twin-cylinder engine that delivers excellent power for navigating cross-town traffic, carving twisty roads, or participating in a track day, the new 2019 YZF-R3 and YZF-R3 ABS models are user-friendly and feature Yamaha’s race-inspired R-series styling. While the ABS model adds confidence-boosting stopping performance, both models are perfect for first-time riders or experienced sportbike pilots who prefer a lightweight, nimble machine. A reliable 321cc liquid-cooled, four-stroke, in-line twin-cylinder, dual overhead cam (DOHC), eight-valve, fuel-injected engine returns as the heart of the YZF-R3. Featuring the latest combustion technology, lightweight forged aluminum pistons, and all-aluminum DiASil Cylinders with an offset design, the smooth-running and quick-revving YZF-R3 engine produces easy-to-manage power. A lightweight steel frame with a simple design incorporates the engine’s crankcase as a stressed structural member of the chassis, resulting in the perfect balance of rigidity and weight. The long, asymmetrical swingarm design effects the efficient transmission of engine power to the rear wheel, while a preload-adjustable KYB rear shock mounted in a Monocross suspension design contributes to a mass centralization of weight. Combined with an all-new inverted front fork, an all-new triple clamp, 10-spoke cast aluminum wheels, a 298mm front brake disc with a floating twin-piston brake caliper, 32 degrees of handlebar steering range, a 30.7-inch (780mm) seat height, and approximately 50/50 front-rear weight distribution, the YZF-R3 chassis produces nimble handling around town and on the race course. To help achieve the right balance of comfort and sport riding performance for both street and track, the 2019 YZF-R3 features an all-new KYB 37 mm inverted front fork. Coupled with an all-new triple clamp that incorporates an aluminum handlebar crown with R-series styling, the assembly works to provide the rider with outstanding handling during cornering and braking. The easy-to-ride character of the YZF-R3 expands for 2019 thanks to a new fuel tank and fuel tank cover design, along with a handlebar position that is 22 mm lower. Fuel tank capacity remains at 3.7 gallons (14 liters), but the redesigned shape of the tank and cover (31.4 mm wider above the knee area and 20 mm lower at the fuel cap) helps to achieve a feeling of unity between the rider and machine. From riding around town to being tucked in on a straightaway or leaned over while apexing track corners, the ability to easily grip the YZF-R3 from multiple body positions allows the rider to take advantage of its full performance potential. The new YZF-R3 features a front fairing and windscreen design that pays homage to Yamaha’s flagship MotoGP® race bike, the YZR-M1, with an aggressive look that also achieves outstanding aerodynamic performance. Developed in conjunction with wind tunnel and track tests, the new fairing and windscreen combination reduces aerodynamic drag (CdA) by seven percent, enabling a decrease in air turbulence around the rider’s helmet when in a tucked position and a top speed increase of five mph during Yamaha tests. The center duct in the fairing also functions to direct airflow to the radiator, contributing to engine cooling performance. New LED headlights and position lights add to the aggressive look of the redesigned front fairing, and a new LCD instrument panel displays essential information that is easy to read at a glance. New Dunlop SPORTMAX GPR-300 radial tires are also featured to provide the YZF-R3 with the best grip in all riding conditions. All of the 2019 Yamaha Supersport models are eligible for the Yamaha bLU cRU Road Racing support program. Racers who choose to register for Yamaha bLU cRU receive benefits that include a road racing contingency program, discounts on GYTR and Graves performance parts and accessories, apparel and more. To find out more about the Yamaha bLU cRU Road Racing support program, visit https://www.yamahamotorsports.com/sport/pages/blu-cru-road-race-membership-benefits. To view the new “R World is Calling” video, visit https://www.youtube.com/watch?v=UpaZ1vVN3Bg&feature=youtu.be. To find out more about Yamaha’s Supersport motorcycles, visit https://www.yamahamotorsports.com/supersport. To see a full range of Genuine Yamaha Accessories, visit https://www.shopyamaha.com. Find more information related to all Yamaha products at https://www.yamahamotorsports.com.